Last week I reported on the secretive heroes of Wikipedia and their detailed academic descriptions of 90s hip hop classics. 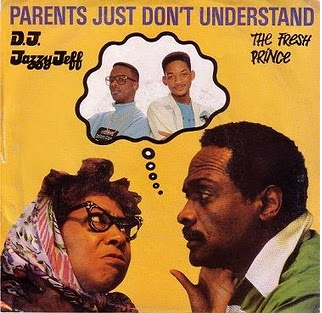 Over the weekend, the author of the two best entries-Warren G and Nate Dogg’s “Regulate” and DJ Jazzy Jeff & The Fresh Prince’s “Parents Just Don’t Understand”-made contact. Earnest Pettie-or Earnestp if you prefer his now-defunct Wikipedia handle-is an editor at Break.com. And now we ask him some questions! From there we went back and forth regarding a few of the issues raised by these two bits of pure Internet gold. I noticed that thus far you have only tackled hip hop duos. Was that by design or just sheer coincidence? You know, do you have plans to tackle any other great duos like Pete Rock & CL Smooth, Eric B. & Rakim, or my own personal fave “It Take Two” by Rob Base & DJ EZ Rock? It is purely coincidental, although that question just made me realize how many rap stars during the first two generations were duos or groups… probably because it was too hard to do it alone back then. I mean, you had to have at least one guy to beat box. Drafts of the entries for “Parents” and “Regulate” appeared on your personal blog on July 9th and 11th respectively-around the same time you published them on Wikipedia-however they really were discovered on a mass level just last week. When did you start to realize you had something big on your hands? I realized it last week. My blog gets very little traffic, deservedly so since my updates are so sporadic and I’m not really known for anything. My wife doesn’t even check it out. Last week, however, there were a couple days where a person or two happened across by searching for specific phrases from the synopses, so I did a little bit of checking and traced things back to a blog entry at ESPN, which I think may have been a watershed moment. Looking further, I noticed that there also had been a popular Reddit thread, which made my day since I’m a Redditor, myself. From a comedic standpoint why does hip hop in particular lend itself so well to these types off descriptions? I mean the synopsis for Rush’s “2112 Overture/The Temples of Syrinx” is hilarious but the “Regulate” plotline is just so next-level. This is going to sound silly, but I think it’s like when Groucho Marx takes the wind out of Margaret Dumont. Hip hop strives so hard to achieve an unschooled posture that translating it with academic-sounding language, ironically, undermines it. That’s why the ODB one worked so well and why my “Parents Just Don’t Understand” one was, in my opinion, less successful. In that one, I was working against Fresh Prince’s purposefully naive viewpoint, which just isn’t the same. I’m glad you brought up the plotline of “Regulate,” because it’s something that surprised me. I don’t really listen to song lyrics-I’m more into the actual music-and I can’t really hold onto lyrics, so I’d never noticed that the song is a narrative with scenes being cross-cut against each other until the two characters meet up. There’s something cinematic about that, and I can’t think of another song that does it! Not even the Beastie Boys’ “Paul Revere”, which has three different characters. That song’s narrative is straightforward with the characters meeting each other along the way. An unintended consequence has been that some people are not totally in on the joke. I mentioned “ironic racism” in my own piece but others have said these are written in “a language that white people understand” or that they are in some way condescending in juxtaposing this heady professorial-type language with lingo commonly associated with rap and hip hop. Did you at all consider any of that before these went up? This is a weird and interesting gray area for me. I’m a black guy who has been accused of sounding “white” before, so the tension in the entries is inherent in me. When I wrote the entries, I didn’t think about any kind of cultural context. I just got that academic-sounding language being used to describe something decidedly unacademic could be funny. If there is a racial response to the entries, I think that it is because educated and uneducated are frequently confused with white and black, respectively, by both groups. So there’s already a tension there. I see how black people could find the joke condescending and white people could find it ironic-racist but neither is entirely accurate. Also, those perspectives assume that these pieces are standalone things when anyone who has read other things I’ve written knows that I frequently adopt a similar “educated” tone in my writing because I love verbal humor and that voice gives you a much broader and more unusual vocabulary to work with in making jokes. I think that’s one of the reasons Woody Allen used it so frequently in his short stories and essays. I appreciate that people found my entries to be funny. That’s why I wrote them and slipped them into the Wikipedia entries. It allows me to more fully appreciate why Dave Chappelle stopped doing his show on Comedy Central. Not that our situations are anywhere near similar, but I do see better how he knew and understood what he was doing was funny but was troubled by the way certain portions of his audience were enjoying them. There has been some talk on the Wikipedia backchannels about these entries with users voicing strong opinions that they remain intact or conversely that they are a prank and should be removed completely. It looks as of now that they will remain on the site though in a somewhat altered form. Have you been following this controversy at all? I haven’t followed the controversy. I know that the community is passionate about keeping Wikipedia credible, which is something I appreciate and support. I only wrote two entries because I thought anything more would pique the interest of the community and they’d delete the entries on the grounds that they were vandalism. With my specific entries, I don’t think there is an immediate reason to delete them. Even though there is a smirk, they represent valid — if opinionated — synopses of the songs. It’s Wikipedia, though, and it is the nature of the site that the edit will stand until someone changes it, and I’m OK with that. â€¨Ok, one last question: if you could write a new verse to the old 3rd Bass classic who would you most like to see get the “Gasface”?